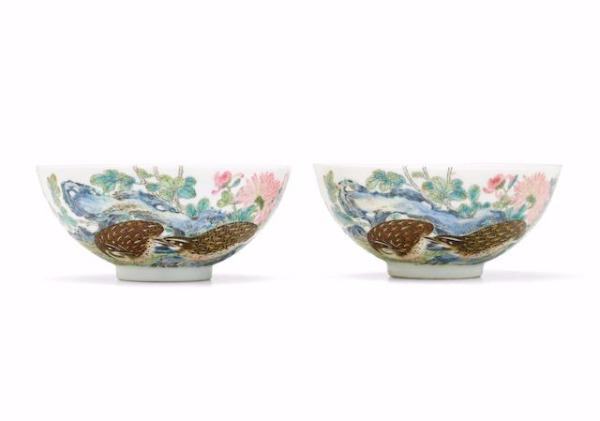 A series of exquisite Chinese works of art will be sold at Bonhams auction house here on March 18, highlighting an exceedingly rare pair of imperial porcelain bowls enameled with quail and chrysanthemums dating back to early Qing Dynasty (1644-1911). The bowls bear underglaze-blue marks of six Chinese characters, saying it was made during the reign of Yongzheng emperor (1678-1735). The porcelain has been estimated at a price target of 0,000-500,000 for its innovative design and delicate artistry, according to Bonhams' product introduction. Chrysanthemums symbolize autumn in ancient China, as the flower blossoms braving cold weather, thus symbolizing fortitude and longevity. While a pair of quail, or shuang an, is a homophone for "peace and prosperity" in Chinese. The palette of the painted and enameled bowls is a combination of fencai, or famille rose, and falangcai, or foreign colors, which can be apparently seen in the brown and ochre enameling of the quail. The continuous decoration over the rim and onto the interior of the bowls also demonstrates complicated craftsmanship. The sale event, titled Chinese Works of Art features, offers exceptional furniture, a strong selection of snuff bottles, early pottery, classical and modern paintings, etc. Additional features of the auction involve a massive pair of huanghuali, a valuable wood in China, hat chests with fine inlay decoration of 17th-18th century, and a rare gold and silver inlaid double-fowl vase originating from Ming dynasty (1368-1644). The event is one of the four auctions held by Bonhams for Asia Week New York on March 18-20, the others including a sale of Indian, Himalayan and Southeast Asian Art and a sale of Fine Japanese and Korean Art. The NYC-based international auction house is one of the world's oldest and largest auctioneers of fine art and antiques.